Sandy Hetland, 75, of Webster City, died Thursday, May 17, 2018 surrounded by her family. Funeral services will be held at 2:00 p.m. on Tuesday, May 22, 2018 at Foster Funeral and Cremation Center with Pastor Michael Slininger officiating. Burial will be at Rose Grove Cemetery, west of Williams. Visitation will be held on Tuesday, May 22, 2018, from noon to 2:00 p.m. at the funeral home. Sandra Ann Riley, the daughter of Leland Leroy and Phyllis GayleWeidman Riley was born on May 20, 1942 in Webster City, Iowa. She attended Webster City Schools. She married Vernon Leone Hetland in Shakopee, Minnesota on July 19, 1969. Sandy was one of the first women to work at Franklins from October 26, 1968 until her retirement at the age of 60. Survivors include her children, Scott Sweazey of Spirit Lake, Shelia Nuehring of Webster City, Dawn Hetland of Waukee; grandchildren, Jessica, Nicol, April, Dannielle, Cory, Sawyer, Valerie, Dillon and Aaron; 16 great-grandchildren; brother, Danny Riley of Webster City and sister, Debbie (Roger) Consier of Joplin, MO. Vern and Sandy enjoyed wintering in Las Vegas for the last 21 years. 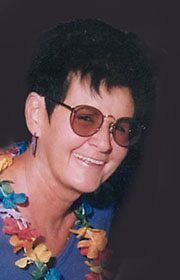 Sandy enjoyed Elvis, traveling, BBQs by the pool, dancing and roller skating in her younger years. Sandy loved returning to her home and family in Iowa after her travels.